Since 2009, FOE has got 192 longitudinal projects above the provincial level and has got the funding of 29.215 million Yuan. These projects include 15 National Social Science projects, 9 National Natural Science projects, 12 National Education Sciences Planning projects, and 11 Ministry of Education’s Philosophy and Social Sciences projects. 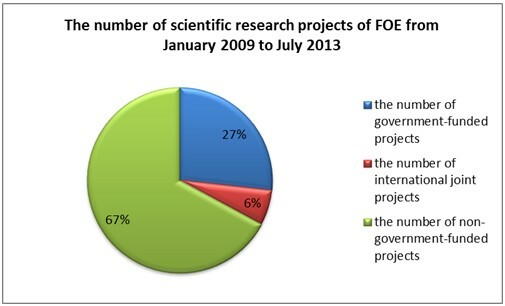 FOE has got 41 foreign cooperation projects and has received 11.3067 million Yuan. There are about455transverse cooperation projects of FOE, which has received 115.531 million Yuan. 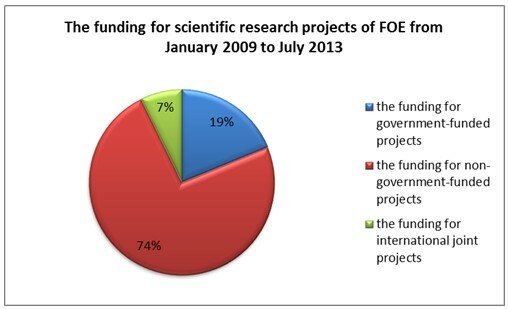 Since 2009, FOE has won 68 provincial and ministerial level scientific research achievement awards. Among these awards, there are 24 National Educational and Scientific Research Awards, including 2 Outstanding Contribution Awards, 3 first prizes, 11 second prizes, and eight third prizes; 2 Wu Yuzhang Prize in Humanities and Social Science, including 1 Excellence Award and 1 Youth Award; 1 Ministry Curriculum Reform of Basic Education Teaching Achievement Award; 12 Higher School Scientific Research Outstanding Achievement Award, including 1 first prize, 9 second prizes and 2 third prizes; 12 Beijing Education Scientific Research Outstanding Achievement Award, including 5 first prizes, 5 second prizes and 2 third prizes; and 17 Beijing Philosophy and Social Sciences Outstanding Achievement Awards, including 5 first prizes and 12 second prizes. From 2009 to 2012, FOE published about 600 works of various kinds, including 118 monographs and 37 translation works, and some works have been published by foreign publishers in English, German and Japanese.